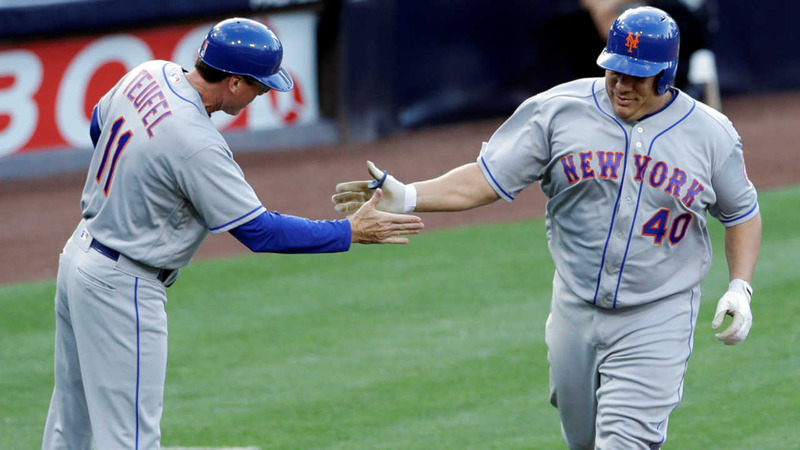 SAN DIEGO, Calif. -- New York Mets pitcher Bartolo Colon hit his first career home run Saturday night, a shot that came less than three weeks before his 43rd birthday. Colon connected for a two-run homer in the second inning off San Diego's James Shields. The impressive drive hit the lower balcony on the Western Metal Supply Co. brick warehouse in the left-field corner at Petco Park to give the Mets a 4-0 lead. Colon watched the ball all the way, and didn't toss his bat until he was well over halfway to first base. The portly pitcher's trot around the bases took about 30 seconds. When he returned to the dugout, his teammates were hiding in the tunnel before coming out to mob him. Colon hasn't had to worry about his hitting. He won the 2005 AL Cy Young Award while with the Los Angeles Angels, and is a three-time All-Star. Before his home run, he was a career .089 hitter in 225 at-bats, striking out 119 times. He usually swings hard, and his helmet often falls off in the process.